Please follow the following instructions for installing BTE’s 350 transbrake valve body. 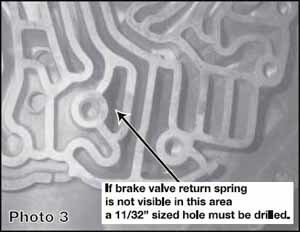 This reverse pattern valvebody (Park-Reverse-Neutral-First-Second-Third) is designed to work only with non-lockup units. If you have any questions, please call our tech line 662-851-3213. STEP 1 Remove transmission from vehicle. Make sure the transmission is cool, as the fluid inside the unit can be very hot. STEP 2 After placing the transmission in your work area, remove the torque converter unit. STEP 3 The stock valve body from transmission must be replaced with BTE 321500 unit. Drain transmission fluid from pan, and remove pan. Make sure to clean any gasket material from pan and pan rails. STEP 4 Remove filter assembly and filter gasket. Remove detent roller and spring assembly from valve body. Remove detent control link. Remove valve body attaching bolts and valve body. Remove valve body spacer support, plate, and gaskets. Remove four check balls. STEP 5 Many variants of the Turbo 350 were produced by GM. While your case may not look exactly like those pictured, it will share same functionality. (See Photo 2 & 3) Remove intermediate servo piston, washer, spring seat, and apply spring. See photo. Drill and tap a hole using a 11/32” drill in the area indicated. Also, drill and tap a second hole in the second gear accumulator area. Plug both holes using 1/8” allenhead plugs included in this kit. Install O-ring onto solenoid. Install spring into end of brake valve. Install spring, valve, and solenoid into modulator assembly area. STEP 6 Remove the front pump. Remove the middle ring (See Photo 1) on pump stator in addition to replacing the bushing, gasket, and seal. STEP 7 Remove intermediate overrun band, intermediate clutch plates, and intermediate clutch wave plate cushion spring. Inspect all parts for wear and replace as needed. STEP 8 Remove the direct and forward clutch drum assemblies. Remove intermediate overrun clutch front snap ring and retainer. Disassemble the intermediate roller clutch assembly and inspect. An upgraded sprag assembly in place of the OEM roller clutch is highly recommended. (BTE can provide this part. Call for more information.) Remove direct clutch pressure plate snap ring and pressure plate. Remove clutches and steel plates from direct clutch drum. Remove direct clutch return spring snap ring with piston press. Also remove the direct clutch lip seal that is in the drum. Prepare to drill bleed pole in drum. STEP 9 Bleed hole for direct clutch drum is best drilled from the inside-out behind the piston area. Hold drill at 45 degree angle. Bleed hole needs to be 1/16” or 0.0625”. Make sure hole is clean of any burrs after drilling. STEP 10 Remove front ring gear, two thrust washers or two needle bearings and check for excessive wear. Be sure to replace worn components. Remove output snap ring and front planetary carrier assembly. Remove sunshell. 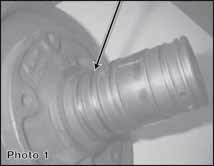 The snap ring that holds the sungear to the sunshell is prone to failure in transbrake applications. Therefore, tack weld the snap ring to the sungear on the front side of the gear. Remove snap ring that retains the low roller clutch support. Grasp the output shaft and pull up until the low roller clutch is out of the case tabs. Next, remove the low roller clutch and anti-clunk spring. Remove the reaction carrier, low/reverse clutches and steels. If speedometer gear is removed, the output shaft and ring gear will come out through the front of the case. Using a press tool, compress the low/reverse return spring retainer and remove the snap ring. This will allow the piston and return spring assembly to come out of the case. It is best to apply air to the piston through the reverse feed hole in the case under the valve body to remove the piston. You should replace all lip seals since the transmission is fully disassembled. Do not reinstall the middle sized seal on the low/reverse piston. STEP 11 After this modification, begin to reassemble the direct clutch assembly. Do not use the center lip seal in the direct drum. Only use the two lip seals that go on the apply piston itself. Install the direct piston into housing. Use transmission fluid to aid assembly. Install spring retainer and reinstall OEM springs. Set clutch pack clearance to .070”-.090”. Remove all cushion and wave plates. Compress spring retainer and install retaining ring. Lubricate with transmission fluid and install friction plates and steel plates starting with a steel plate and alternating steel and friction. Install direct clutch pressure plate and retaining ring. Install intermediate overrun roller clutch assembly. When the intermediate overrun clutch outer race is installed, it should turn free in a counterclockwise direction only. Install intermediate overrun clutch retainer ring. Tack weld snap ring to retainer. STEP 12 Install assembly in reverse order that parts were removed. Do not use intermediate band. STEP 13 Begin to reinstall valve body parts. Replace old separator plate with plate and gaskets supplied in this kit. Reinstall OEM support plate. Do not reuse any check balls. Reinstall valve body in the reverse order of disassembly. STEP 14 For transbrake activation, a solenoid microswitch must be wired. 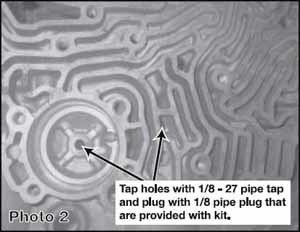 A minimum of 12 gauge wire is suggested to ensure the least amount of circuit resistance. Run a hot wire from microswitch to the battery. The other wire goes directly into solenoid or delay box. Make sure the ground wire on the solenoid is properly grounded (chassis ground). Also, make sure a secure connection is made at all wire connect points. Strap any loose wires that may drag under the vehicle. STEP 15 Fill transmission with quality transmission fluid. BTE’s Super Shift fluid is designed to withstand the high stress of transbrake use. Contact BTE for more information on this product. Start engine and let engine warm up. Shift transmission several times and recheck fluid level on dipstick. Add fluid as needed to match full level.